Located in North West Orange County, Cypress is an urban community and home to several national and international companies. Originally this Orange County city was a land of agriculture and dairy farms. Today, after a real estate boom in the 1960’s and 70’s, almost all of the land in Cypress has been developed. Cypress is a family oriented community and has a burgeoning business environment with a population of over 49,000 people. You will find that a large proportion of the homes in Cypress are newer. Cypress homes for sale are on average the newest in the nation. Overall this Orange County city is a community of office workers, professionals and managers. Costs of Cypresss homes for sale are among some of the highest in the nation, although real estate prices don’t compare to the most expensive communities in California. There are 3 different school districts within Cypress; Anaheim High School District, Los Alamitos Unified School District, and Cypress Elementary School District. Oxford Academy, a college prep school, is the most widely known in Cypress. In 2009 it was ranked 4th in national public high schools. Cypress homes for rent are a great option for those that are not looking to become homeowners. The average rental price for a home is currently at $2150. 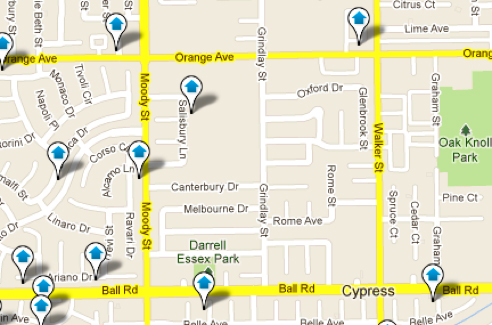 Come and check out the real estate opportunities in Cypress. It is definitely a live-work Orange County community.